i will have a solo performance this week on Thursday, July 3 at aceartinc. in my hometown, Winnipeg. the event is organized by local artists Kelsey Braun & Cam Popham, who will perform in their new duo Swolewes. The evening will also include a performance by local Evan Sabourin. Event starts at 8:00 PM and is $8 at the door. I am very pleased to be a part of a wonderful new CD release by trio D.O.R (Jamie Drouin, Lance Austin Olsen and Mathieu Ruhlmann). The four of us worked together in the summer of 2012 to record an array of material – one piece was included in the Wandelweiser und so weiter CD box set on Another Timbre. It was an absolute pleasure to work with these three lovely gents whose work is thoughtful, nuanced and deeply sensitive. 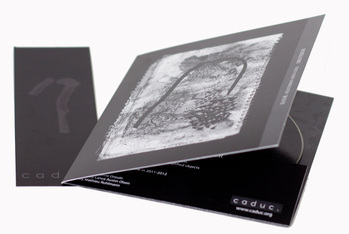 Two pieces that we created in these sessions are included on this wonderful new trio CD release on caduc., HESTEKUR. I will be in Barcelona performing in Oren Ambarchi’s Knots ensemble this Friday, June 13 as part of the 21st edition of the Sonar festival of Advanced Music and New Media. I am thrilled as always to perform in this incredible group alongside Ambarchi, Joe Talia (drums), Eyvind Kang (viola & string leader) and this time joined by the full Sinfonietta Cracovia from Poland. this will be a very special concert indeed!